Broadcasts from Maidan Square yesterday included Orthodox and Catholic prayers, and recitation of the Rosary, praying for peace before the truce was broken, and later to Panachidas for the souls of those murdered by snipers. You can read the names of the dead, and their birthdates and home district, at http://espreso.tv/new/2014/02/21/identyfikovano_73_zahyblykh_spysok including Nazar Voytovych, who was 17 when he was shot down. Obviously a dangerous person, a Nazi hooligan who threatened the safety of Yanukovych’s Ukraine. The dead come from all over the country, including the east. “When we sat here together on Monday, we could not imagine what would happen to day. We spoke of the need for sacrifice, but I don’t think we imagined it would come so soon. Sacrifice and martyrdom brings fruit. This does not justify the actions of the government today, nor the behavior of the titushkos [hired thugs], our police or the Berkut [special forces unit]. Ukraine is a country with valuable natural resources and the black earth which made her a breadbasket, but also the state through which Russian gas and oil goes to heat Europe’s cities. Kyiv is the birthplace of Rus’, which gave birth to Ukraine, Russia and Belarus. Moscow has always wanted to rule the Mother of Rus’, usually without treating Ukraine well. Ukraine was split between Russia and Austria, then the USSR and Poland, and united in 1945 under Stalin. The breakup of the USSR left Ukraine independent of Russian rule for the first time since 1653. Mr. Putin wants Ukraine back – his offer of $2 billion purchase of bonds is what set Mr. Yankovcyh on this course of crushing the opposition instead of continuing negotiations. Mr. Putin sees this struggle for Ukraine as a competition with America even though President Obama does not. He wants Ukraine in a restored Russian empire, along with Kazakhstan and Belarus. Remember that he believes that the fall of the USSR in 1991 is ‘the greatest geopolitical catastrophe of the 20th century’.Our defense secretary’s call to the Ukrainian military office was not answered – if Mr. Putin had been placing the call, it would have been answered! Ukraine’s military chief who said he would not fire on civilians has been dismissed: a very bad sign. Will the army be called on to shoot its own citizens? The language used against the opposition is that of the Soviet past: they are thugs, hooligans, terrorists, extremists, fascists, and equals of the Nazis — the last two are especially heinous terms among the peoples of Ukraine and Russia! — who are not true patriots. Mr. Yanukovych knows that this is not true, but by falling back on such words he hopes to stir up at least concern about the opposition in Ukrainian minds – and he is backed up in these words by the Russian government and Mr. Putin. Yanukovych’s Titushko gangs of real thugs are roaming the capital and its suburbs to frighten people from supporting the protesters in the city center. They have successfully kept protests in the eastern oblasts (states) small and quiet. That is not going to work in Kyiv though! Not after today’s bloodshed!The Saint Michael Cathedral of Kyiv is now both a dormitory and a surgery center for those wounded by snipers. The pro-democracy people of Ukraine are suddenly making new sacrifices, with their lives and bodies, in hopes of their country becoming a free democracy with a free economy unfettered by the ruling oligarchs who have plundered their land. Mr. Putin is of course a former KGB agent of 16 years’ standing: he famously said that he would be insincere if he criticized what the KGB did in communist times. He watched the collapse of the Soviet Union’s most fervent ally, East Germany, from his station in Dresden, from which he had recruited East German professionals who traveled to the West as intelligence agents. Back home in Leningrad/ St. Petersburg, he left the powerful KGB forces on the second day of the attempted coup against Gorbachev in 1991 and soon went into Russian politics. He wants to restore the Russian empire, and control over the Mother of Rus’ is critical. He has been pushing Ukraine to join his Eurasian customs union, along with Belarus and Kazakhstan. If those three countries join, then most of the old Soviet empire will indeed be back. One of our biggest mistakes was not implementing a Marshall Plan-type in Eastern Europe after 1990, and truly helping the ex-communist states in moving forward economically and politically. If our country does not put pressure on both Messrs.Yanukovych and Putin, it will be making a serious error in judgment. Mr. Putin is running circles around us with his support for Assad in Syria, where 130,000 people have died – mostly civilians at the hands of their own government – and Iran’s mullahs. Please, Mr. Obama, act now and act with conviction! If we want to make progress on Syria and Iran, we have to show that we will stand up to Vladimir Putin and show Eastern Europe that he is not going to restore the Empire of old. Virgin Orans in St. Sophia – 11th century mosaic. Legend says that as long as she stands, Kyiv will survive. 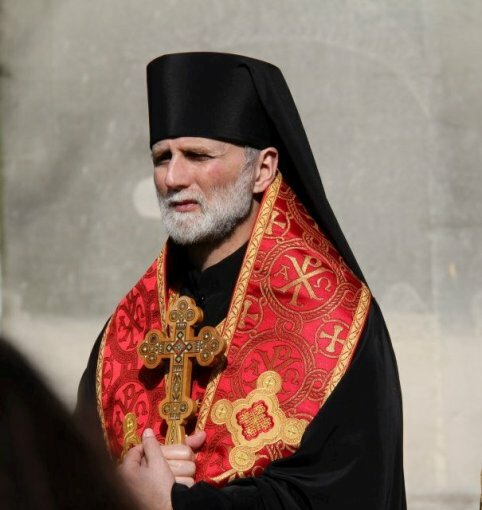 Major Archbishop Sviatoslav Shevchuk has asked the Catholic world to say one Our Father and one Hail Mary daily at 2 pm for the intention of a peaceful free Ukraine, and that those who say the Rosary would add Ukraine to their intentions. The Holy Mother of God is a powerful defender and advocate – may her prayers help soften the hearts of those who would crush freedom! The oldest image in Kyiv is that of Our Lady in the St. Sophia cathedral, lifting up her hands in prayer: Holy Mary, pray for Ukraine, and pray for the world that all may listen to your Son, the Prince of Peace, and establish his rule in all hearts. « Disaster in Ukraine!! Pray to God that peace and freedom may reign instead!